The cold war is heating up again, yet we must view these geopolitical tussles like children squabbling as a much larger danger creeps towards its next child-sized meal. Past civilisations knew the threats they faced. This danger was usually men on horses with swords, and so spent vast amounts of their resources to combat that. Today all nations, united or not, have a common enemy that is the unintended consequences of our industrialisation. Today we argue over spending ridiculous amounts of money on updating nuclear missile capabilities over a threat that no longer exists. The real threat to our nation comes from the planet itself. In the 21st-century, smart countries have learned to invade other countries not through brute force, but through trade agreements, resource, land and property acquisition. Self-serving military minds are still trying to convince you to waste vast swaths of money on a threat that no longer exists. The more pessimistic of you out there may say the invasion occurred decades ago already. Either way, the most significant threat to your lifestyle comes not in military camouflage, but as weather patterns, ocean currents and frequency of storms and drought. The reality is people won’t be bothered by global warming until it’s on their doorstep. 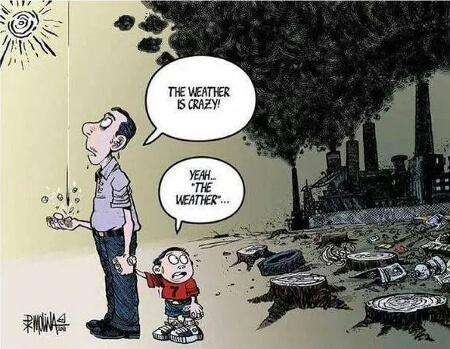 The existence of global warming will hit home when atmospheric storms leave our government unable to cope with the frequency of its effects financially. Complacency and taking the natural world for granted is a strategic failure. Failure to protect our very own biological life support systems is strategically as incompetent as Hitler’s impatience to pick a fight before he had the hydrogen bomb. A prime example of military pride getting in the way of common sense. If ‘the Fuhrer’ had waited five more years to begin his world conquest, then today after only three generations, we would certainly be speaking Germanic. Fortunately for us, Parkinson Disease made Hitler impatient and that cost him the war. The atomic age gave our baby Boomer parents a sense of vulnerability and invulnerability in equal measures. The age of industrialised consumerism was also born and the changing of the atmospheric chemistry that came with alongside that. After the cold war, new threats had to be devised to keep the ‘threat’ level, and military spending, high, especially the nuclear age had now lost its psychological effect. Meanwhile, year on year the real threat of global warming and ecological destruction across the world has been creeping up on us like a panther in the night. Step-by-step the danger has been growing – yet those with interest in keeping us consuming at any cost have concealed the inconvenient truth. Even today, our politicians and media convince us that ‘more of the same’ is the answer to what created the problem in the first place. As Einstein once said, ”Insanity is doing the same thing over and over again and expecting different results”. This picture shows this isn’t a planet with intelligent species! The clear and present danger of global warming is now in full view! The storm clouds are gathering as tipping points get reached, and a world of unintended consequences begins to play out worldwide. The military industrial complex will always create new threats to justify their budgets, but these endless amounts of funds worldwide today need to be diverted to combat the most significant threat known to humanity since Noah’s flood. The threat today is our inability to see the threatening storm clouds of our making. So you think global warming isn’t a threat? Our ocean currents are in trouble and more specifically the transatlantic conveyor that provides us with the green and pleasant land we have become accustomed. The trade winds as they were once known, rely on warm oceanic currents that stretch from the Caribbean to the Northern Western tip of Scotland, to circulate the temperate climate. I have always warned that the term ‘climate change’ was derived from taking the sting out of talking about global warming by the media and the fossil fuel industry – I digress. The reality though is that it’s a global problem if oceanic currents change and it’s a warming problem that is dumping infinite amounts of fresh water and diluting the salinity of the oceanic conveyor. This warming has reduced the Arctic sea ice melt significantly and is now affecting the wider Atlantic currents. The Arctic and Greenland ice loss is estimated to be now 1.19 million square kilometers (460,000 square miles) below the 1981 to 2010 average extent – that’s huge! 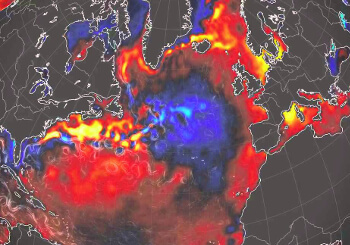 The effects of this growing cold blob have been detected for at least two years now. The Arctic melt has caused this significant cooling in the region that hosts our essential gulf stream currents. This shift is creating detectable weakening and a reduction in the amount of heat transferred to northern Europe and more specifically the UK. This abnormal cooling in the Atlantic is expanding into a cold blob causing stronger than usual winds whilst increasing frequency. As more fresh water ice coming off Greenland continues to dilute the salinity (salt water) of the North Atlantic, the conveyor is creating changes in atmospheric bands of wind. As more atmospheric warming caused by less of the sun’s heat being reflected by ice, now locked into a runaway global weather paradox. As the conveyor belt continues to allow colder temps over northern Europe, then flooding will increase, especially as the additional problem of rising sea levels continue to grow. Our planet is changing faster and more unpredictable than any climate model ever predicted, but ironically with all the infinite amounts of spending on military hardware that has occurred over the last three generations, the most prominent threat of all went ignored. I know solar panels aren’t as cool as an Apache Helicopter, but they would undoubtedly have been more useful in safeguarding your children’s future. Boy’s and their toys, eh!